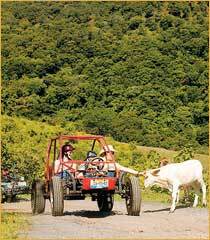 Pilot your own jungle buggy (also called dune buggy) up into the wilds of the Sierra Madre. Forge the sands and waters of the Indio River, splashing and throwing mud all the way into the jungle-draped mountains. Race from the quiet beach town of Bucerias into lush plantations and farmlands before stopping at a restaurant in the traditional town of El Valle for a quick dose of Mexican culture. Weave your way in and out of plantations, canals, and farmlands before finishing back at Bucerias. Down and dirty fun! Includes: Goggles, Bandana, Soft Drinks, Mexican Lunch at Senor Frogs. Valid driver's license and prior experience. Camera - We recommend a waterproof camera. Look at the photos and you'll see why! However, if you go slow, you won't get wet, so you can bring your regular camera. Departs From: Wild ATV offices in Nuevo Vallarta / Bucerias. Directions will be included with your confirmation. Kids: Drivers must be 18 years old and have a valid drivers license. Riders can be ages 4 and up. Kids are the same price as adults. Not recommended for pregnant women or elderly individuals. Each Buggy can hold up to 2 people. All Dune Buggies in Puerto Vallarta are manual shift.